The above graph shows there are over 72,000 pages that the IRS can hold taxpayers accountable for in reviewing tax returns. In addition the IRS will be enforcing the ObamaCare legislation which consists of anywhere from 906 pages to 2,700 pages depending on your source (people have altered margins & font sizes to come up with their preferred length) – but that is just the start. In October 2012 I posted that the IRS & Treasury had already issued thousands of pages of additional new rules & regulations, including 40 notices, 17 regulations, 5 revenue procedures, 2 revenue rulings, & 14 Treasury decisions. As an example the Washington Examiner reported that the bureaucrats @ HHS & the IRS needed 18 pages to define the term "full-time employee" under ObamaCare. The point is - regardless of the exact number of pages we should heed Professor Morici's above warning. Thanks to Congressman Frelinghuysen for alerting us to the House series of actions taken earlier this month to combat the government's overreach & in many cases outright abuse. "Like most Americans I was outraged by the recent revelations that Internal Revenue Service (IRS) officials abused their power. The disclosure that the IRS targeted conservative organizations has put a bright focus on the immense power federal bureaucrats from hundreds of different agencies have over matters small and large today. When these officials abuse their power and waste tax dollars, the economy slows, the rule of law is threatened and our liberty eroded. "Each year, federal agencies issue hundreds of regulations, covering everything from domestic energy production to what kind of ceiling fan you can buy to rules governing magicians who use bunny rabbits in their acts. "These rules are not approved by your elected leaders who are accountable to their constituents. These same agencies then have the power to enforce the regulations they themselves wrote. And often they even have the power to judge whether the accused is actually guilty. The penalty for violations can range from monetary fines to seizure of property to jail time. "When confronted by agency officials who enforce all these rules, citizens can quickly find that they have few rights and little recourse. Career government officials who are caught abusing their power are often simply put on leave – with pay! Even when federal officials are not abusing their power, it has become nearly impossible for the average citizen to navigate the typical agency bureaucracy and get even simple answers to simple questions. And each year agencies squander our precious tax dollars by hosting lavish conferences for their employees. "To top it all off, under ObamaCare the IRS – the same agency that has leaked confidential taxpayer information, targeted groups based on their political beliefs, and even told groups that they had to give up their First Amendment rights – has gained new powers to collect information about whether you have health insurance and the type of health insurance you have. The IRS will then determine whether your insurance meets the government's standards and if not, impose a penalty on you. "Last week, the House debated and passed a series of bills designed to put the brakes on government over-reach and, in some cases, outright abuse. "Some people have labeled last week, 'Stop Government Abuse' Week in the House of Representatives. I would rather refer to it as 'Common-Sense Week' and I hope the Senate follows our lead, passes these bills, and transfers power from federal bureaucrats back to the people." Keep the IRS Off Your Health Care – Did you know that the IRS has a role in nearly 50 different aspects of ObamaCare? Their involvement is so extensive that they have established an office within the IRS just to implement ObamaCare. H.R. 2009, authored by Rep. Tom Price (GA) prevents the IRS from implementing any portion of ObamaCare. The legislation passed the House by a vote of 232 – 185. Keep Bureaucrats from Slowing the Economy and Lowering Wages – Each year federal agencies issue dozens of economically significant regulations which are estimated to have an impact on the economy of greater than $100 million. H.R. 367, the Regulations from the Executive in Need of Scrutiny (REINS) Act, authored by Rep. Todd Young (IN), requires Congressional approval of regulations that cost over $100 million. Rodney is a cosponsor of this common-sense measure which passed the House by a vote of 232-183. 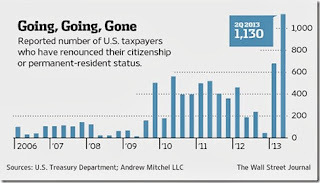 Citizen Empowerment Act – Federal agencies not only write rules, they also get to enforce them. In fact, it was recently noted that "a citizen is 10 times more likely to be tried by an agency than by an actual court. In any given year, federal judges conduct roughly 95,000 adjudicatory proceedings, including trials, while federal agencies complete more than 939,000." In these proceedings, citizens have fewer rights than in a courtroom. The Citizen Empowerment Act, H.R. 2711, authored by Rep. Lynn Jenkins (MO), ensures that individuals have the right to record their meetings and telephone exchanges with federal regulatory officials engaged in enforcement activities and requires that individuals be notified of such right. Common Sense in Compensation Act – Federal agencies routinely award significant annual bonuses to virtually all of their senior managers. H.R. 1541, sponsored by Rep. Mark Meadows (NC), would not only place limits on the size of bonuses but also limit the number of senior agency employees who may receive bonuses in any given year. Government Employee Accountability Act – Even when a senior federal official is under investigation for serious misconduct, agencies have little disciplinary recourse except to put them on paid leave, where they can continue to collect a paycheck for months and even years. H.R. 2579, authored by Rep. Mike Kelly (PA), allows agencies to place employees on unpaid leave when they are under investigation for certain serious offenses. Government Customer Service Improvement Act – Government is one of the few areas where entity and personnel reviews are not linked to actual level of service provided. H.R. 1660, sponsored by Rep. Henry Cuellar (TX), requires agencies to adopt customer service standards and to hold their organization and federal workers accountable. This bill passed the House on August 1, 2013 by a voice vote. Government Spending Accountability Act – It seems that every week another federal agency is in the news for wasting taxpayer money on another lavish conference. H.R. 313, sponsored by Rep. Blake Farenthold, (TX) increases transparency with respect to taxpayer-funded conference, places limits on federal conferences, and requires agency head approval for the most expensive conferences. The House adopted this reform bill by a voice vote. Stop Targeting Our Politics IRS Act – H.R. 2565, sponsored by Rep. Jim Renacci (OH), would allow the termination of employment of IRS employees who use their official position for political purposes. The measure passed the House by a voice vote. Stop Playing on Citizen's Cash Act – The IRS continues to hold conferences even though it has failed to adopt the reforms recommended by the independent Inspector General to prevent abuse and protect taxpayer funds. H.R. 2769, sponsored by Rep. Peter Roskam (IL), imposes a moratorium on IRS conferences until the IG's recommendations are implemented. The legislation passed the House by a voice vote. The Taxpayer Bill of Rights – H.R. 2768, sponsored by Rep. Peter Roskam (IL), amends the authorizing law that creates the position of IRS Commissioner to make clear that it is the duty of the Commissioner to ensure that Internal Revenue Service employees are familiar with and act in accord with certain enumerated taxpayer rights, including a right to privacy and confidentiality. The House approved this measure by a voice vote. "Doug -- Most interesting and I will share it with folks here. You are right that people love quizzes. You can find our Losing America's Memory historical literacy quiz at the back of the report (on our website) and you can also see the answers Roper got from college graduates on basic questions of Civics and American history at www.whatwilltheylearn.com. (It flashes midway on the screen). The results are not heartening! Click here to see ACTA's historical literacy quiz with the answers & results immediately displayed. The results are based on interviews conducted from August 10 - 12, 2012. A total of 300 interviews were completed, with 150 female & 150 male college graduates or post graduates who were between the ages of 21 to 34. If you are like Anne (& me) & find the above results disheartening I repeat my often made suggestion to thoroughly review ACTA's free resource website What Will They Learn if you know someone who is considering going to college in the near future. I don't know of a better investment of their time in getting started with the research concerning the most important decision a young person has to make that will affect the rest of their lives in so many ways. Thanks to all the good sports who took the quiz on the last posting. Click on Quiz - Science & Technology to read the responses I posted. I particularly highlight for your attention the lone comment that question # 12 was a trick question – it was a very observant remark that was not acknowledged by the official scorekeepers of the quiz but nevertheless is true. I'll bet many in this readership will agree with the point once they realize it. As a follow up to the science & technology quiz please look over the 1912 eighth grade exam from a Bullitt County Kentucky school presented by another long time subscriber. The obvious results from this exam provide a tremendous example of the deterioration of America's government school system since 1912. Many of us knew people in older generations whose formal schooling ended @ the eighth grade level – & I for one didn't consider such people that I knew uneducated. I have a good reference point regarding the education profile of the last 100 years because my father was in the eight grade shortly after 1912 & he did not go beyond eighth grade. He owned his own business for over 30 years & was proficient in the three "R"s. As a boy I would hear him talk to friends & family about civics & history – much like the type of things I write about today on RTE. I don't know if I could have passed the above exam in 1958 when I was an eighth grader & I'm not sure I know any recent college graduates who could pass it today. See a link between this trend in education & the employment opportunities & income gap in America? Thanks to a long time subscriber for sending the latest of the ever popular quizzes that readers almost clamor for. This quiz presents thirteen questions & follows up with the answers & your results compared to others of your gender, age, & education for each of the questions. I will post results you present as appropriate. 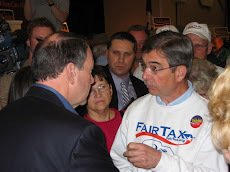 The three choices for the poll are the FairTax, the Heritage Foundation's New Flat Tax, & 9-9-9. Herman provides his own thumbnail sketch below describing each of these plans. Herman knows the FairTax always wins these types of polls so I think he is using his poll as a mechanism for him to get back on board the FairTax team after his brief sojourn to 9-9-9. Let's not let him down – you can cast your vote by clicking on the link @ the bottom of the page. 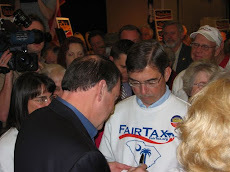 FairTax national says "Cain states that once his audience makes their choice, he will go national with a replace the tax code program 'that the politicians cannot ignore.' In order to vote, you must 'opt-in' to his program so your vote counts, however, his site also says you can 'opt-out' after you vote." !CAIN Alert!Take Action!CAIN Alert!Take Action!CAIN Alert!Take Action! A 23 percent (of the tax-inclusive sales price) sales tax imposed on all retail sales for personal consumption of new goods and services. While permitting no exemptions, the FairTax provides a monthly universal prebate to ensure that each family unit can consume tax-free at or beyond the poverty level, with the overall effect of making the FairTax progressive in application. As a result, a person spending at the poverty level has a 0 percent effective tax rate, whereas someone spending at twice the poverty level has an effective tax rate of 11.5 percent, and so on. Currently, in addition to the income tax, the federal government imposes a payroll tax, death tax, and a slew of excises. The New Flat Tax replaces them all for individuals, families, and businesses with one tax system with one tax rate of roughly 28 percent. Two Tax Credits: The New Flat Tax retains the Earned Income Credit to preserve the level of income support for low-wage workers. And low- and middle-income families also receive a tax credit of $3,000 ($2,500 for singles) toward the purchase of health insurance. Three Deductions: The only remaining deductions are for higher education, gifts and charitable contributions, and an optional home mortgage interest deduction. In 1996 Steve Forbes supported a flat tax of 17 percent on all personal and corporate earned income (unearned income such as capital gains, pensions, inheritance, and savings would be exempt.) He supported keeping the first $33,000 of income exempt. A 9% corporate flat tax. Businesses would deduct purchases from other businesses and all capital investment. The resulting gross income is taxed at 9 percent. A 9% personal flat tax. Individuals would deduct charitable contributions, then pay 9 percent on the rest of their income. Capital gains are excluded. A 9% national sales tax. This levy would be placed on the consumption of all new goods. Used goods purchased would be excluded. As a follow up to the last posting that showed how the current city of Detroit is a microcosm of future America please click on this link of Mike Huckabee's excellent video from his July 20 program on FNC where Governor Huckabee presented the first eight chapters of Detroit's history that led to the filing for bankruptcy under Chapter 9 of the bankruptcy laws. Chapter 10 depicts America's decline under BO's vision that involves all of us. 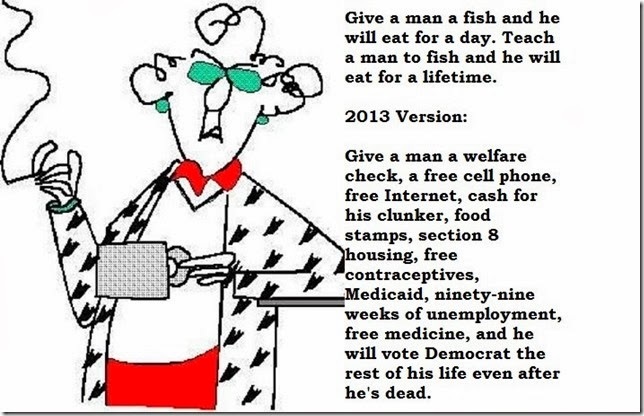 As the employment-unemployment statistics deteriorate & part time jobs, government dependency, & family wealth spend down continues throughout the citizenry, without a whimper, terrible heart wrenching examples come to light. I know of an example where the husband has disability income, the wife is unemployed, & both the husband & wife have sold their wedding rings to help make ends meet. Hard to believe this could happen if you didn't see it with your own eyes. But not everyone is waiting for the metaphorical ax to fall. 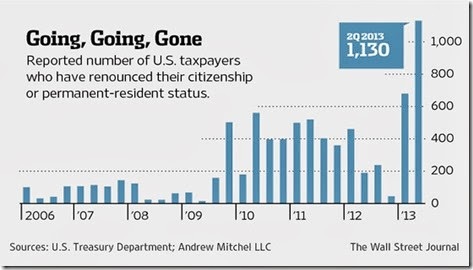 The above graph shows the increase in the number of people who have renounced their U.S. citizenship or permanent resident status since 2006 – notice the increase since BO took office. If the top 1% of income earners, or others on the way up, were smart enough to get to this top rung they are not going to be dumb enough not to have an exit plan. America will miss them one day just like Detroit does already. Many investors in the readership will recall in the 1980s the largest municipal bond default in U.S. history – the Washington Public Power Supply System (WPPSS) which became infamously known on Wall Street as "Whoops". The agency could not repay $2.25 billion (in 1983 dollars) in bonds used to finance partial construction of two nuclear power plants. Other Washington state bonds with AA ratings saw their values plummet just because of the name Washington on their highly rated bonds – of course this was a tremendous buying opportunity for some. Well a similar thing has already started happening in Michigan & is spreading throughout the $3.7 trillion U.S. market for bonds sold by cities, states, & other government related entities. Genesee County, Battle Creek, Saginaw County, & triple-A-rated counties Macomb & Oakland which borders Detroit's Wayne County are all making pitches to the ratings firms not to lower their ratings just because of proximity to toxic Detroit – whose municipal bankruptcy filing is the country's largest. Last week Saginaw County postponed a $60 million bond offering because of low investor demand meaning higher interest cost than the county could afford. The U.S. municipal bond market is about the same size as the market capitalization of China's stock market – domestically incorporated companies listed on China's stock exchanges - so it can have a significant impact on the American economy. At one time Detroit was America's wealthiest city by per capita income & fourth largest by population – then its manufacturing base collapsed. Today Detroit is the city with America's lowest median income ($25,000), it has lost over 60% from its peak population, over half the children in the city live in poverty, just under half the residents are functionally illiterate, & the unemployment rate is 18%. One third of Detroit's 140 square miles is a wasteland – forlorn, forsaken, vacant, &/or deserted. The decreasing population abandoned over 33,000 homes. There are now 91,000 vacant lots. In some areas houses on entire blocks have been razed. Some neighborhoods have ceased to exist & as they disappeared so did all traces of human life. Some of the above should sound & look familiar already in many areas of our country. It should not be hard to imagine the rest of the country following suit as BO's plan continues to be implemented. The cost of the citizenry not being involved is clearly shown above regarding what our futures look like with the prevailing government-dependent mindset. It is getting very late but it must be recognized that national political leaders who want to continue the type of policies that led Detroit to ruin are not on the same team – in fact they are on the exact opposite team - with the rest of the unsuspecting citizenry who are being led to the same fate experienced by the people of Detroit. After FDR's December 29, 1940 speech Detroit became known as "The Arsenal Of Democracy" because of its strength as a car manufacturer that could quickly adapt its manufacturing capabilities to build jeeps, M-5 tanks, & B-24 bombers. In fact FDR honored Detroit's efforts in this regard by declaring it "the great arsenal of democracy." Also, labor union leader Walter Reuther (UAW) said "Like England's battles were won on the playing fields of Eton, America's were won on the assembly lines of Detroit." All of this capability & patriotism is slipping away – it hangs by a thread not just in Detroit but across America. Below is the transcript of Governor Huckabee's excellent monologue from the above referenced video. "Detroit is broke. Belly up. Busted. Bankrupt. Largest city in the history of the U.S. to file for Chapter 9. But a city the size and significance of Detroit doesn't go straight to chapter 9. For over 100 years, Detroit has been the leading edge of trends in America. Chapter 1 was the birth of the automobile and the creative geniuses who innovated the internal combustion engine and harnessed its power to move people from place to place much faster than horses and much more individually than trains. Chapter 2 was when Henry Ford conceived of a new method of manufacturing the car that would revolutionize industry and the economy. Chapter 3 was that mass manufacturing made the cost of a car affordable for the masses and cars became a ubiquitous fixture in American life and the symbol of upward mobility. Chapter 4 was Detroit saving America. It was precisely the Motor City's prowess at turning steel, chrome, aluminum, & rubber into personal transportation to making planes, tanks, and ships that gave us the tools to win World War 2. Without Detroit, we might all be speaking German or Japanese. America must never forget Chapter 4. Chapter 5 is that after the war, Detroit once again unleashed its magic into building post-war America into a nation of industrial workers who made good money and good machines and whose heavy lifting created the Happy Days into which Baby Boomers were born and the middle class that gave their parents the steps of the ladder to climb beyond the poverty of the Depression and the pain of the war. Chapter 6 was Detroit's contribution to the culture. It was the greenhouse of the music of our lives---from the immortal moves of Barry Gordy's Motown sound to the hard charging guitars of Nugent, Mitch Ryder, the MC5, America's pop culture was influenced if not shaped as much as was our taste for whitewall tires, chrome grills, and bucket seats. Chapter 7 was one of America's largest cities being rocked by the race riots of the 60s and the beginning of the polarization that led to white flight to the suburbs and the beginning of a population decline. Chapter 8 was Detroit being utterly ruined by breathtaking corruption of its local government and by union demands for a bigger piece of a shrinking pie both in the private and the public sector. The city's government didn't have the will to rein in the corruption nor the guts to say no to the unions. And that took them to Chapter 9. Bankruptcy. The saddest part of the Detroit story is that it's not the story of a failed city who couldn't. It's the story of one of the world's great and most successful cities who could, and who did great things, but then was willing to sell its soul for lesser things and to tolerate unthinkable things. It's unemployment rate has tripled since 2000 and is twice the national average; and its street lights don't work much more regularly than its people—40% of the street lights stay dark. It's homicide rate is epidemic and for 20 years, it's been considered one of America's most dangerous cities. It takes the police an average of 58 minutes to respond to a call compared to 11 minutes average elsewhere. Just under 80,000 city structures have been abandoned. Detroit once was the leading edge of America. Now the bad news: It still is. Take a good look at Detroit in all its former glory and current gore and know that as it has been on the front of America's trends, it still is. Detroit is today what the rest of America is on track to being in another 20 years--Reckless spending, corrupt unaccountable government, and caving in to demands from those dependent on its cowardice to never say no. If we don't learn from Detroit's collapse, the rest of America will be the next chapter." As a follow up to the last post re everyone's personal information being known to a pizza delivery order taker I thank a long time subscriber of RTE for sending this link that demonstrates the high definition technology that helps police find suspects in large crowds such as in the Boston Marathon bombing case. Just keep double clicking on the photo @ any one point & it won't take long before you can make a positive identification. The scroll button in the center of your mouse will further help. The photo provided is made up of 216 photos (12 across by 18 down) stitched together, taken over a 15-minute span, and is not supposed to represent a single moment in time but the point is if you were in the crowd everyone can know it. Great technology but like everything on the internet it can be used for good or evil if people think about it enough.